Building a basic website is an important skill for the entrepreneur, employee, and citizen of the Internet. Using these skills to share your work online has benefits to you and others that justify the costs in time and effort required to do so. And sharing from your own domain gives you control over your data and teaches you about how the internet works. My time spent "learning in public" so far has taught me a lot and also helped out some other like-minded strangers on the internet.1 I hope to share how you can experience this as well. Sharing your work online brings benefits that can't be had working in seclusion. The single most important reason to share your work online is for the personal learning it enables. Sharing publicly can be uncomfortable but the additional pressure can help you learn with a rigor that would otherwise be lacking if it was just for yourself. Sharing is a risk in that others may ignore you or even ridicule you. Polishing your ideas enough to share online is often the final step needed to solidify your understanding of a topic. Also, hearing people point out your mistakes might not be fun but it is a quick way to find and correct them. They say that teaching is the best way to learn. On the Internet your students are people who find what you share to be useful or interesting (as well as your future self, who very well may thank you for taking the time to write up your findings). Plus, it freezes the topic while it is fresh in your mind for your later self to revisit and relearn from. Notes to a future self are often reason enough to write something down in the first place. The learning in writing these blog posts was immense. While these blog posts are public, I think I am the biggest beneficiary. Not only does one gain a good understanding of the concept involved, but one also gains confidence about the subject and one's ability to understand! The key lesson is to document your learnings, understandings, and try to abstract out your specific problem and think of teaching the concept to someone who doesn't know much about your problem. Sharing your work is the first step in building a meaningful body of work. You will be able to take pride in pointing to something you created, and it might open other opportunities for you as well. A typical knowledge worker may not as naturally create this body of work as an academic, artist, or craftsman for instance. Taking the time to fashion your more nebulous contributions into tangible pieces of work that can be published is a way to ensure your work accumulates over time rather than simply being lost to time. Building anything worthwhile takes time and energy. More than actively pursuing a goal, sharing online should come from a mindset of always improving. What you write up and share may be the first tentative steps of something bigger that won't materialize for quite some time. I like the story of how during World War I Winston Churchill "carefully filed memoranda, documents, and letters" away for inclusion in his memoirs.4 He went on to write The World Crisis, a 6-volume history of the war that secured his family's livelihood for many years. What could have been lost was instead built up in small pieces as events happened and later assembled into a meaningful final product. Practical benefits may come from this (job offers, friendships, etc. ), but the intrinsic benefits will suffice. This body of work is a journal of your intellectual development, an online repository of knowledge for future reference, and something you can point to with satisfaction and say, "I made that." The feedback I have received from the relatively little I have published online has already been helpful. The reality of the internet is that it shrinks the world making geographic proximity irrelevant in finding and conversing with people who share similar interests. Rude feedback can be ignored, but even negative feedback will help you if received in the right frame of mind. There's no quicker way to learn than by having others point out your mistakes. It goes without saying that if you want to build a business in today's world an online presence is required for all but the rarest exceptions. You need a way to reach customers, accept payments, respond to questions, and build a network. A website need not be complex and expensive (or built by a professional) to meet these basic needs. Sharing online can clearly benefit you a lot. The best part about sharing online is that it benefits other too. A lot of what I know—apart from what I have read in books—I learned from what other people have shared online. Since you're reading this you probably have as well. Sharing some of your knowledge online is the best way to pay it forward to others. One challenge to overcome is the desire to only share what is perfect. But much of what you produce will be useful to others long before it is perfect. Granted you won't know what may be useful to someone else, but if you have put any amount of time into learning something you are probably underestimating rather than overestimating how useful it could be. 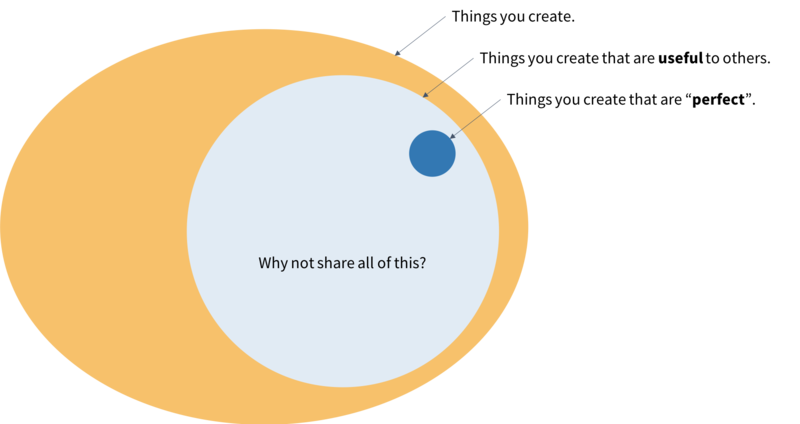 Multiple of these points stress the importance of sharing from your own domain. For the others, you might find my GitHub Pages Example helpful for learning the basics. Whatever specific technologies you choose, sharing from your domain rather than on a platform owned by someone grants you the most control in your online publishing.